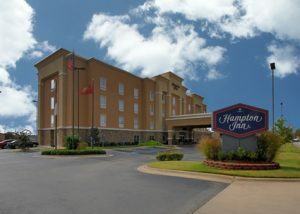 Welcome to the Hampton Inn Bryant, set just a few miles southwest of Little Rock. This engaging area features a wide variety of fantastic restaurants sure to suit any craving. Take a trolley ride to check out all the shopping options, catch a race at Oaklawn, tour the Clinton Presidential Library or step back in time at the Historic Arkansas Museum. Nature lovers are also in for a treat as Bryant is convenient to state parks at Pinnacle Mountain, Toltec Mounds, Lake Catherine and more. Whether you’re into boating and fishing or finding new trails to hike – it’s all in the area or within easy reach. Stay at this welcoming Bryant hotel and enjoy a range of amenities to make you feel more comfortable during your visit. Start each day with Hampton’s free hot breakfast, or just grab a Hampton On the Run® Breakfast Bag, available Monday to Friday for a tasty treat to take away, any weekday morning. Swim laps in the hotel’s large indoor pool, or work out in the fitness center with a range of cardio machines. Stay on top of work in the business center, fully-equipped with fax, photocopying and printer access, or host a meeting in the hotel’s 702 sq. ft. of meeting space.